Graphics manipulation system with artwork creation tools, graphical design elements, and desktop publishing workflow. Pros: GIMP really has it all: apart from being open source (free) to start with, it supports a plethora of image formats, including animated GIF, PDF, PS, RAW, TIFF and even text (TXT). It features a single-window mode, which is convenient when working with only one monitor, while the multi-window mode is incredibly useful to divide any work being done on two different monitors. It offers many filters and third-party extensions to ease some more tedious aspects of image manipulation. If you are into programming, then you can even take advantage of the exposed libraries, which allow you to programmatically modify images with any tool available in GIMP using Python or Scheme as programming languages. 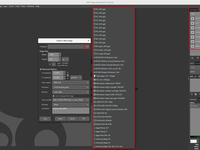 It is also customizable to the core: you can add and remove menus and icons on the fly; you can define the exact resource consumption of the application by specifying details for memory usage and even the number of CPU threads to use; you can have completely distinct configurations for normal mode and full-screen mode; you can create brushes or import from existing creations available online, the same being true with textures; you can configure and add keyboard shortcuts for almost any action you may require to perform and configure many settings to correspond to the default behavior you want in most situations. Cons: GIMP wasn't made to work with Photoshop images (PSD). It does support them, but the experience isn't as good as with Photoshop. Some types of filters apply many different steps and can't easily be undone, which is sometimes frustrating. Unless you are an expert, the Script-Fu Console is not intuitive at all for newcomers and makes it hard to guess what you can actually do. Some filters and effects won't have a complete description immediately available explaining how the image is expected to be modified. This can be inconvenient when trying out new things, as a few filters take a long time to run and may cause the system to hang for a while depending on how the system allocates priority to the application. On the same subject of filters, it is also hard to guess how long a specific effect may take to render as many filters apply a number of steps in a row, resetting the progress bar at each step. Some filters may also have corner cases to consider, for instance when working on a very large image resolution: when rendering a pattern, it can show signs of incongruence if the image isn't scaled down a bit first. Overall: The fact that GIMP is freely available on all major operating systems ensures that you can work seamlessly from any computer in the native format provided (XCF) or any other supported format. I have used GIMP many times to edit PDF files, either to add annotations or to conceal confidential information, which is easy to accomplish with a filter such as "Pixelize". For certain programming tasks, it came handy to create paths with the Bezier tool, exporting the information to the SVG format, which can be read with a programming text editor in a breeze. I have also benefited from its great stability, once creating more than a hundred layers on a single image. Since it can handle as many layer groups and layer masks as you wish, it is possible to iterate over one idea over and over again, discarding only specific modifications. There is also a useful "Undo history" tab that takes a visual snapshot of the state of the image at each particular point in time and gives a meaningful name to each step, facilitating the retrieval of a desired state. Pros: GIMP is also known as the GNU Image Manipulation Program. It is a great photo editing program that is stress-free to use. It has a lot of things to do with unlimited options on what to do for a picture to make it look cool. The wonderful thing is, it's free! Advantages, As you can expect, GNU Image Manipulation is used to edit images. This program makes photo editing very enjoyable and easy. Sure, there are essential things you should learn before you become an expert, but when you learn these first tips for beginners, you start with the start of stunning photo editing plans. Unlike photo editing, the GNU image manipulation program can also create small videos and animations. Despite the difficulty of creating these images, they are still fascinating and really fun. GNU Image Manipulation is one of the best images editing software available. All you have to do is go to the GIMP site and download it for free. Gimp is always available and updates are often shown with fun things to do and discover them in the program. Another great thing about GNU Image Manipulation is that you can add new things to the program. Unlike waiting for an updated date, you can go ahead and download some plug-ins from their site right away! Also, you can add different fonts and different brushes to the program to make your photo stand out. Cons: GIMP has limited 8-bit depth, making it an unexpected choice for professional use in the first place. Gimp has disadvantages when compared to Photoshop in trivial issues the fact that it lacks the advantage of color management and does not provide control layers. Overall: In conclusion, when using Gimp you will learn how to create fantastic site graphics and compelling WEB to graphics. Gimp educational online videos are the best way to learn how to use Gimp. GIMP is software you install on your computer. To my knowledge there is no SaaS (online software-as-a-service) counterpart. As a regular Linux user one huge benefit for me is that GIMP was initially created for the Linux environment. But unlike many Linux programs, GIMP has a true Windows version that is not poorly ported over. It's as elegant on Windows as it is on Linux. There are no penalties for installing GIMP on each and every computer you own and I've never encountered problems when mixing and matching the files from different flavors (i.e., Windows or Linux). It's rock steady; I don't remember a time when GIMP actually crashed. And if you are ready to exit, GIMP always reminds you to save any unsaved changes to your designs. GIMP has a simple uncluttered interface. "Simple interface" is relative; many menu items have dockable windows (like its commercial counterparts) so managing the various docking windows is what will keep it simple and uncluttered. One of the first things I ever used GIMP for was to import and edit some graphics saved in PhotoShop. I'm not a designer so I don't understand what half the tools do; I use only a few of the many features on a regular basis. Primarily I use it for quick web graphics, banners and graphics for blog articles, converting images to different formats, and sometimes to take screenshots (but others screenshot tools are quicker and more intuitive). Cons: It would be nice to have a few "modes" that hide or reveal tools based on your anticipated usage. For example, a "novice" interface mode would be nice. The help system is decent but is a bit cryptic and designed for the designer (not a layperson). I would love to see better intuitive context-sensitive help. For example, hovering over a tool would give a much more understandable explanation. The screenshot tool could be more accessible (when not working in GIMP). Overall: Overall, GIMP is a fine open source replacement for PhotoShop and some of the other expensive creative suites. For a layperson who occasionally designs a banner or image for their website, GIMP is probably overkill and downright daunting. But for a graphics design artist or someone who likes to dabble, the toolset is robust, with elements to rival its commercial counterparts. I don't mind dabbling and doing my own simple graphics. As an open source proponent, I like using tools that give you the freedom to do with them as you please. For example, I use GIMP on both Windows and Linux platforms. GIMP has been a staple in my toolchest for many years. Its a solid choice for heavier graphics work; I use it alongside simpler tools (like screenshot utilities) and in conjunction with snazzier tools like Canva. Pros: I have been using this software for many years to edit images and perform work at the request of my clients in my work as an independent professional, retouching images, banners, logos, among many other things that I have been able to do without complications with GIMP, this application is free , I can use it perfectly without cost, this advantage is very important for me, I love that there are versions for Windows and Linux, since it is possible to install it from repositories, it is easy and it does not waste time searching the Internet, it has many options that include the possibility of programming your own filters this option Although it is very advanced for me, it seems excellent for the future. Another thing that I like about this software is light, I have been able to run it without problems on computers with very few resources, this has got me out of trouble on more than one occasion. It is important that there is a good amount of extras, like filters and brushes, that can be downloaded from the Internet completely free, I like that a lot. Cons: What I like least about GIMP is that the existing documentation is very little in English and even less in Spanish, most of its users are German or Russian and the information you have is not good for me, the GIMP community is very small . It is difficult to find someone who will really help you if you have a problem or do not know how to do a particular task. The additional components that can be downloaded from the Internet are free, but not many. It is necessary to perform a manual work in other applications are performed automatically. It has functions that are very advanced and not very intuitive, it has cost me to discover some functions on my own. The graphical interface seems a little sloppy, this could improve to make it more attractive for a larger group of people. Overall: GIMP has brought me many benefits in recent years, I have edited in record time images for the websites that I have designed, I have made business cards for professionals, being a web programmer knowing that GIMP has complemented me allows to offer web pages without having to always resort to a professional designer, which reduces the costs of my projects for the end customers, in my work in the company has served me to perform specific tasks when working with web pages. I am very happy with this software that has been very useful for years and has taken me out of trouble. My bosses and clients are happy with my work. Surely I will continue using GIMP for many years. Pros: GIMP can do just about anything Photoshop can do, plus a few of it's own unique tricks. It easily converts between image formats including SVG files, and can read & write Photoshop PSD files. 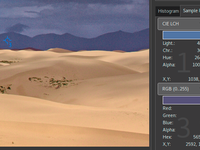 GIMP can also import Photoshop color pallet files. Some examples of GIMP's advanced features include layer styles (various effects that you can apply including shadows, borders, an emboss effect, and more), content-aware resizing (resize background elements without affecting foreground object), face swap, change object colors, cartoonify your photos, and create animated GIFs. Other useful features include red eye removal, make your own watermark, create custom brushes, and remove colors from some objects (like background). 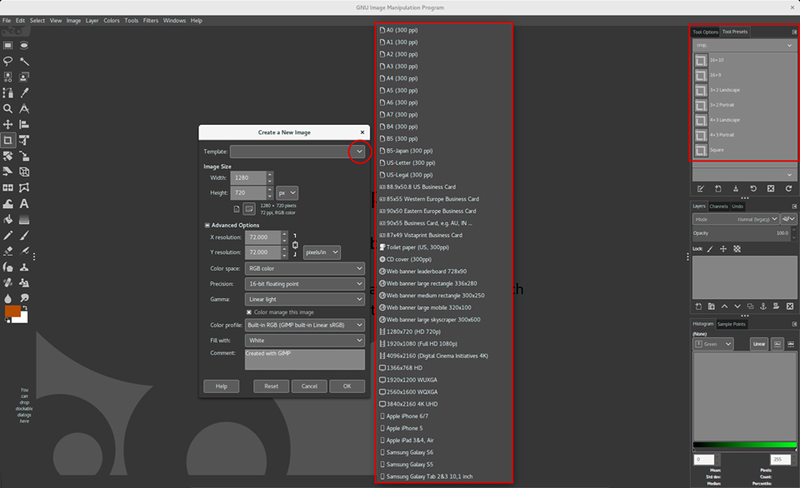 There are many useful plugins you can add to extend GIMP's functionality, for example image compression for web, and batch processing for adding a change to many files automatically. 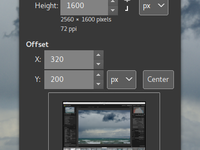 The PSPI plugin the adds the ability to use third party Photoshop plugin filters within GIMP on Windows and Linux. There is also GIMP Portable, a no-install, portable version of GIMP. GIMP Portable can be added to a USB key or hard drive drive, letting you bring the image editor with you. You can keep your favorite plugins and brushes with this package in order to have your entire working suite of image tools with you. GIMP is open source and has a large, active community of developers and users. This means GIMP will continue to evolve but will remain free for all. Cons: As is the case with a lot of free software, some features feel less polished than their commercial counterparts. Some user interface elements may not appear as pixel-perfect as Photoshop, and some interactive features not as smooth. While the GIMP on a Mac feels more stable, the Windows version can be buggy and prone to crashing when using some plugins. The Windows version can also be very slow to start on older PCs, especially when you have a lot of plugins installed. I think the most common critique I've heard about GIMP is the steep learning curve. In my experience, GIMP wasn't really any harder to learn than Photoshop but a lot of users find Photoshop to be more user friendly. In some ways I agree, for example Photoshop seems to be better at guessing where I want to crop an image, or where I'm trying to position a layer so I spend less time fiddling with these controls. Photoshop also feels faster than GIMP when run on the same Windows PC. Loading images, and launching plugins are noticeably slower, although batch processing is at least as fast as Photoshop. Pros: GIMP is cross platform and will run equally well on Linux, Windows and Mac. This is a big advantage for people who use different computers but are collaborating on a project. My favorite feature of GIMP 2.10 right now is its ability to open RAW files using either Darktable or Rawtherapee where the user can make adjustments, and when finished, close Darktable (Rawtherapee) and have the edited image open directly in GIMP for further editing. This is brilliant and offers a greatly improved workflow for photo editing. A new feature in 2.10.6 is vertical text layers, or the ability to write text top to bottom. This is useful for writing vertical-reading text in Chinese, especially for the creation of formal or fancy documents or invitations. It is also useful for creating interesting layouts in English. Much has been written about GIMP's 'healing' features that allow removal of unwanted items in a photo. In GIMP, this can be done using the Resynthsizer plugin, or the Inpainting plugin that is included in the G'MIC plugin set. While both work well, the G'MIC plugin seems to yield somewhat more consistent results. Cons: Until recent editions, GIMP suffered from a rather unattractive interface and opened the main editing window and toolbars separately. While some users preferred this, I found it awkward to to use and arrange on my limited screen space. A single-window mode was introduced in version 2.8 which I prefer. I tried switching to GIMP in Linux back in 2009, but found it awkward to use and wasn't able to achieve the results I wanted easily. Recent versions have been much better and now, with the release of 2.10 which integrates with Darktable, GIMP is a powerful tool indeed. It is open source and free, but please do make donations to support the development of these amazing tools that benefit many users who truly cannot afford to pay for software. Pros: I'm a happy and frequent user of GIMP especially after some experience using photoshop as well. It is important to clarify that GIMP is the kind of software that does not try to compete or overpower Photoshop. The most important aspect is that it is not developed commercially and it's free and open-source, unlike Photoshop. All its updates are also free and you can have it on as many computers as you want. It provides with a bunch of free plugins and I even had the chance to play around with the source code of some. GIMP also has its source code available to compile and that makes it available to wide range of systems that Photoshop might not support. Installation is as easy as it can get and runs smoothly even on older computers. I also enjoy the flexibility on keybindings, it can make the work process much faster. The settings being portable to different workstations makes it even more convenient. Cons: The interface can be a bit confusing (I never liked so many floating windows) but that's the case with o lot of similar software too. There is a deep learning curve that is accompanied with not the best documentation, but once you get familiar with it, it shouldn't be a problem. In terms of usage from professionals, there are a few limitations so it shouldn't be considered as a strict replacement for Photoshop. It lacks a few features like CMYK, but there are several plugins to overcome those. Some points that mainly come along with the fact that it is a free open-source piece of software include that it can be buggy sometimes as there is no official quality assurance team. The user community is responsible for reporting bugs and updates and fixes can consequentially take sometime. It can also be a bit slow, but at least it is not as resource-hungry as other alternatives. Jump works on several platforms: most of the platforms of UNIX and its children such as GNU Linux, Macintosh among them, in addition to Microsoft Windows. The program is light and small size does not exceed 16 MB. Free and free, and you do not have to pay too much to use, you can download and use it for free. Supports Arabic by default and does not need a special version to support Arabic. A complete set of painting tools. Anti-Aliasing (Sub-pixel sampling) technology is available for all tools. Generating gradients with great magnificence. Add custom brushes, gradients and patterns. Advanced memory management (tile based memory management, sic) makes image size limited only to free space on the hard drive. It does not support 16-bit accuracy and this is my opinion the flaw is the good news that this defect will be resolved in the next version according to some sites. Pros: The overall and best thing about this software is that it is free. This is a great alternative to Adobe Photoshop, and will not disappoint you. The fact that this software is free does not mean that it is lacking in features. Gimp has many ways in which you can retouch your images, has amazing tools for cropping, colour adjustment, noise reduction, gradients, customizable brushes and many other tools that you can use. If you are looking for more advanced features, Gimp also covers this with layer masks, filters, bezier curves and even has an animation package. The customizable brushes are a must for any artist, and adding them is so simple. This makes Graphic Design and artwork very easy to achieve the look and feel that you want. Cons: Occasionally, and I mean very occasionally, Gimp software might have a little glitch. This does not seem to effect my work though, and I haven't lost any, but may result in a action box remaining on the screen after it has finished doing it's thing. This is not really a problem though as I just place my window that I am working on, over the top of it, and it is no longer visible. Overall: Gimp does not have all of the features that Photoshop does, but is pretty close, and the fact that it is free you can't complain. The software is however open source, so you can make changes to it, and a quick google, and you can normally find a way or a tutorial to achieve what you wanted. I love Gimp and have been using it for years for Art and Graphics design, as well as other personal projects. The software is able to save your work in so many formats, making it easy to use your work across other platforms. A massive thumbs up. It proved to be a very powerful tool and a fantastic OPEN SOURCE competitor in the market. Pros: Well, obviously, it's open source! That means it's going to cost you nothing. Even if you compare it to other popular paid software around there, Gimp is not going to let you down. All the basic and mid-range functionalities are available and user friendly as you're probably used to. If I want to mention a specific thing that I love from GIMP, it's that you can Ctrl+Z when you mistakenly add a point with the lasso selection, and also you can combine polygonal selection with free-hand selection. Small details like these make of GIMP a great option at no cost. I started using it professionally after formatting my pc. I've done a lot of photography edits for customers (wedding, birthdays, etc.) and for websites (online stores) and I have never encountered a situation when I had to go back to the software I used to have. Also, every update brings new original features. The creators are not trying to be a copy of another paid software,they are trying to create a very unique tool that stands out by itself. Cons: Slow evolution during its opensource nature: 7 years happened from 2.8 to 2.10, but Gimp 3 is estimated to be out at some point of 2018 so this might be changing due to the success of the last update. Shortcuts: moving to Gimp can take a couple of days of adaptation if you're used to work with other software because the commands are completely different, but as I said, it's just a couple of days. Also, it can get tricky if you want to automatize some parts of the edition. It can be done if you follow the right steps but I think they need to improve that part and make it more user friendly. Overall: Saved me a lot of money and made easy some of the common tasks I have as photographer and web content administrator. Pros: As an editor of an internal communication medium on a daily basis, and in the absence of private licenses for the installation of software recognized for graphic editing, Gimp became an ally for journalists who had to edit their photographs daily before uploading it to the news portal . The ease of installation, and ease of use for editing and retouching photos in size, color, brightness and resolution is for beginners and there is a lot of information and online tutorials for those who do not know it. Cons: Very little publicity about its existence and the new features that the new version brings; besides, it is not intuitive for other functions that are not simply the retouching of images or photographs; as a competitor of photoshop it's a great alternative, but for quick and easy designs for social networks, there are other more intuitive programs for people who are not specialists in design program management. The official support is not very clear, and you should always resort to tutorials from other users. Overall: Actually for me personally it has been a great advantage to have Gimp because I can use it on any machine without the need for licenses, and it works a lot for the retouching and editing of photographs that is the main use I have given to it and that I have recommended to my supervised that they use. It's easy, fast, it's light, it's practical and no more expertise is required. Pros: Gimp has very positive characteristics that complement my functions as a photographer. While I use other software to design and edit photographs, Gimp is also part of my repertoire. An excellent layer management to make the images much more colorful and realistic. These layers in turn can be combined in thousands of ways, making the software a creative solution for all graphic designers. Another interesting element of this software is that you can make or edit images that can be supported through scrips to be inserted into web pages. This feature is very important because it allows me to save time in the elaboration and coding of the image for the blogs and web pages that I currently use. Cons: Sometimes I have to resort to other image manipulation software by vectors since Gimp does not have this option. I also think that this software lacks certain tools, however, I would not stop using it because I like the quality that Gimp offers for editing and the formats it allows me to work with. Overall: Gimp is a good software for editing photos and images. It allows obtaining quality results for the management of photographs, having multiple formats to obtain the final products. Despite the disadvantages I mentioned above, I would not stop using Gimp, and I recommend it to the entire graphic design community, they will not regret acquiring it. Gimp is a great alternative to Photoshop - and Free! Pros: I've been using Gimp since the early 2000s and have used Gimp on Windows and Mac. They stay true to what they do, which is offer excellent affordable (free) open source software alternatives. I'm also a Photoshop user. I love that Gimp has grown over the years to really offer a solution that can give Photoshop a run for it's value. You can import your images, and have all the features you'd expect to see from Photoshop (filters, layers, etc etc). Gimp is a stable open source tool. I've never done a deep dive into how Gimp and Photoshop uses resources but I feel like Gimp has a lighter footprint on my Macbook when I'm running other apps. Cons: If you've never touch photo editing software before you need to get to know the tools offered - this will be overwhelming for someone that doesn't have an interest in graphic arts, or getting to know some cool imaging software. An easier tool if you're looking to do some simple photo handling would be Fotor (also free). If you're familiar with Photoshop then you would need to adapt to Gimp, but it's really less of a learning curve. You're just taking time to see how Gimp presents it's editing tools. The Gimp user interface doesn't look as fancy/smooth as Photoshop - this isn't really a dislike. Because I've been around for so long using the tool, I appreciate what I think is a bit of a retro look for the tool. Anyone new to Gimp, don't let that deter you, because the functionality is really powerful. Overall: Really impressive to see how Gimp has grown over they years. I'm an advanced user when it comes to handling image manipulation but I'm not photographer/designer level. There are a lot of features available, like handling RAW and SVG files that I haven't even played with. Overall, a free alternative to Photoshop? That's pretty amazing. And yes, you can open .psd files here in Gimp and work on content very similar to how you would in Photoshop. I haven't had to use their technical support but have found information in their Help area. -Works with many Operating systems like Windows, Linux, MacOS, etc. Cons: When I started to using GIMP I had a bit hard time to learn it documentation and some video tutorials are bit outdated. GIMP is good for non Professional photo editors compared with Photoshop. For the Cons side I only experienced that. Pros: I'm not sure of his popularity, because I met him using Linux. However, he has been a faithful companion in regard to small editions of images and that kind of thing. I even remember using this light tool in a project of internal communications and the truth was not bad for us. It was the program that we had at hand and it worked. For day-to-day work it works quite well. It has a kind of toolbox with multiple features that can easily get you out of trouble. One of the functions that I like most is to optimize the images automatically, with the opportunity to customize it if one does not obtain the expected appearance. Cons: I think it competes against many similar apps. However, I would not necessarily see it as something against. Another aspect maybe not very positive and I think it's something that I can do with other similar tools, is that for more advanced uses, some type of prior training is necessary to get the most out of this tool. It's great to have multiplatform tools like this one. He could become the faithful friend of any user who faces the editing of images in his work. I think it's worth trying, it also has a portable version, for me it's very useful. Pros: It's Free. You can create professional images without paying a cent! Gimp comes with all the basic functionality of an advanced image manipulation program. Cons: It's almost always behind premium software available on the market. Because GIMP is open source new features usually come long after premium competitors have released them. No cloud collaboration. I can't work wing projects in a group. Installing plugins can be challenging. Recently I failed to install the plugin that allows me to export to the new WebP format. I also had a hard time installing the batch Processing plugin that allows me to apply batch processes like resizing or compression. Sometimes the plugin repositories are moved, broken or incompatible with the installed version of GIMP, so it takes a bit of extra effort to get new functionality. Overall: I've been using GIMP as my primary raster image editing software for over 3 years. GIMP is a free and open source software (FOSS). I use mostly free and open source software because starting out I could never have afforded the licenses for most premium software. FOSS also generally demands fewer resources from your computer, which is true for GIMP. I use GIMP on a Core i3 laptop with 4 gig RAM running on Linux UBUNTU. I didn't give a customer support rating because strictly speaking there is no customer support for GIMP (as far as I know ). There is a wide range of online resources and forums that are as good as, and in some cases better than most customer support, though. Powerful, free and highly customizable option for photo-editing and digital painting. Pros: GIMP is currently the most popular freeware option for photo-editing and digital painting, and there are good reasons for it. First of all, it consumes less RAM than many other options in the market, it has a very reliable stability, it rarely crashes and you do not need high-specs for it to work smoothly. It runs in most OS and platforms, including Linux, where it originated and was later ported and optimized for Windows and Mac. The Interface can be customized with a variety of impressive alternatives and plugins that can emulate similar softwares. It is as powerful as the other distinctive apps, being able to cope with the great results achieved by other creative suites. I also must admit that GIMP works transparencies like a champ. But their most possitive asset is their friendly and helpful community, with people enhancing and designing plugins, providing tutorials and help all free of any cost, to the extent that the users are the first providers of customer support. Cons: The user interface can be somewhat confusing, this might depend on the plugins you are using and the compatibility they have between each other, this is a cost you always run into when using highly customizable applications. It might run slow when working out extremely large files, but on the bright side I never really experienced any crashes. The graphic interface feels outdated. Very limited options when it comes to text editing and pixel manipulation. Overall: My experience with GIMP is overall positive, it is a reliable free option. Give it a try, it might end up surprising you. Pros: In my work as a Community Manager, it is important to manage software that allows editing and resalar images, this, combined with a good coatching, enhances and enhances the accounts, adding more followers and more interaction of that account in Social Networks. GIMP, is an excellent software that gives me what I'm looking for, since it has a comfortable interface that allows you to interact with tools to remove or add light to the images, the management of different layers, which allows you to add more visual elements to the image, add effect to the photos, and, one of the most important reasons why I use GIMP is that it supports different formats like png, jpg, and gift. Cons: I think the GIMP technical team could work on improving the tools they offer to modify the photos, since other software has more powerful tools for image editing. Overall: GIMP is one of the first photo editing software I could explore. Working with this software is quite easy has many benefits and benefits for editing that have allowed me to project my career as a Community Manager. A comfortable interface that combines a series of tools that although not complete, has a high range of functions that makes it continue using the software and recommend it to all those who need to edit photographs professionally and creatively. Pros: It is the most used and popular image editor in my work since it is multiplatform, it also has a very friendly environment and for those people who do not dominate the computer it is very simple, as well as for those who find it easy to get inside of the tools and exploit their potential at the time of mounting images and have an excellent finish, as well as being free software and being able to take the portable with me and install it quickly and easily on any computer. Cons: It has multiple tools that make the manipulation of the image very simple and with great potential for editing them, besides being very light, but when installed in some operating systems, the toolbars are deconfigured, which makes image manipulation complicated although already having experience configuring it, everything is fixed. Overall: In the foundation in which I work one of the activities is participation in social networks and we all know that an image says more than a thousand words is for them that a team is responsible for the editing and manipulation of images and another part of the publication of social networks, when I started working with him I had an incredible potential since I could make great editions and give life to images that were not so attractive. That is why when I found out about this tool, I called myself So much attention. Pros: I was looking for a free alternative to Photoshop and GIMP was recommended to me. Maybe it is because I have no design experience but I found it took quite a while to get familiar with all the features. It's easy to work with the basics like resizing, cropping etc. However, working with layers can be challenging. There are helpful videos on Youtube but most people appear to have a different method of doing the same thing, which makes it confusing. All in all I have been able to produce and edit graphics in GIMP but I think that you would need to use it every day for a while to become proficient. I really like the feature you can use to make even the most complex images transparent. I edited all the images for my website and blog using GIMP. I can't compare it to Photoshop as I've never used it. I recommend GIMP if you have the time to learn how to use the different features. Another feature I really like is that when I download fonts on my P.C it goes straight into GIMP, so I can use new fonts on the graphics I design straight away. There are so many features for free that you would normally have to pay for with design software like Canva and PicMonkey. Cons: I don't think it's very user friendly. It can be difficult to get all the icons to display, even though I followed the instructions on YouTube (it could be that the person was using a different version). I think the design could be more intuitive but it does what it is meant to and for open source and free software, can't really complain. I also think that GIMP is geared towards the more advanced designer. Overall: I wanted to design graphics for my website and social media channels. GIMP is great for creating unique designs for free. Pros: It's free and is an outstanding alternative to PhotoShop, with all the functions most people, including professional graphic designers, will need. Cons: Some functions can be glitchy, and even accessing the help function doesn't always help. But there are a multitude of online resources to help. Overall: I've been using Gimp for years for advanced photo editing. I use other programs for simple editing, but when I need more detailed and/or targeted editing, Gimp is great. You can create PNG images with transparent backgrounds; delete and replace backgrounds; selectively edit colors; use a multitude of special effects; etc. You can orient a text box to match the orientation of an item you're adding text to (which my simpler programs don't do). I find Gimp to be as powerful and easier than PhotoShop. I don't work in layers, so can't speak to the ease, or lack thereof, of doing that. Advanced functions aren't intuitive; looking up how to do things is a must. Also, Gimp can be glitchy. In particular, I've found the clone tool to be very good, but even when accessed properly, it sometimes doesn't work. This seems to be a common complaint. Sometimes the problem is that you're not in the right layer. But even in a single-layer image, I often have trouble, especially in the new version, v. 2.10.4. But there are also some improvements in this upgrade. I'm not a professional designer, so my knowledge and ability are limited. However, I've recommended the program to many people, and an advanced PhotoShop user recently told me he thinks Gimp is just as good. Overall, for me, Gimp is a perfect solution when my basic photo-editing programs won't do the trick. I highly recommend it. Pros: GIMP is an excellent raster graphics editor, that could be used to retouch photos professionally as well as design web graphics. The software is equipped with a number of tools, that enable both elementary and complex operations. The interface is transparent and uncluttered, as the icons are minimalistic and the windows dockable so that you can fully customize the editor to meet your needs. Converting between different image format is seamless, so you are able to import and edit files saved in Photoshop format. GIMP is open-source software, so it's developed continuously, and there are many powerful plugins available. Personally, the Gimp Animation Package is an exceptional solution to create GIFs. Moreover, the tool is completely free of charge. Cons: It's difficult to discover some advanced on your own, as the majority of the community is German or Russian. For that reason, if you encounter a complex issue, it might be challenging to find someone, who knows the solution. 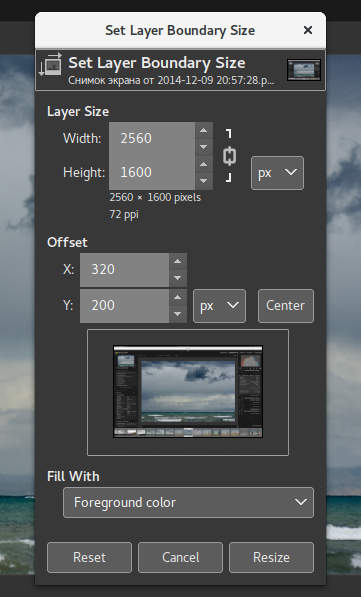 Overall: GIMP enabled me to edit images and photos quickly using the BIMP extension. Also, I designed a few graphics and created some simple animations (GAP) for my website. First step to become a design expert! Pros: Open source, light, powerful but free! Gimp was my first design software when I first started to learn to create graphic on a computer and I still use it every now and then whenever I need a quick change on a design but didn't have time to wait a year for photoshop to pop up. The functions GIMP offers is more than anything one could imagine in a free software, it's almost everything you need from photoshop AND illustrator, from filtering and tweaking image, to drawing your own image. The effects GIMP provides are still everything I needed in my career. It can be similar to photoshop in some way, so it will be super helpful to start using GIMP for someone who didn't understand the complexity of Photoshop (like me my very first few months, then switching to Photoshop'd be a breeze)There are also free online tutorials everywhere on the internet, so it's really for EVERYONE and everyone (plus every kind of computer and OS-- i had a Linux before using macOS). Overall: Design software CAN be straightforward and CAN be for everyone and GIMP has proved me so. Very easy to use as I didn't have a ton of time to learn tech and software when I first started, but GIMP was at ease to use and didn't take me 120 hours to learn and start. GIMP is very portable and I love it that I could have it on any of my machines without having to worry about "how many licenses do I have left." GIMP is just awesome! Pros: As a technologically inclined creative person, this software is amazing. There is ample support in the way of forums and videos on the internet to get most anyone up and running with GIMP fairly shortly. My favorite elements of GIMP are its robust image layering abilities. While it might lack some of the glitz and glamor of Adobe's Photoshop, it is able to completely keep up with the functionality - at least on a basic level. I've found GIMP completely able to meet and exceed my logo deign, web graphics, and photo editing needs. While professional photographers might want Adobe's subscription products, GIMPs download-and-use platform is a fantastic discovery for those who want robust image editing for free, and are willing to put the leg work into the small learning curve. Cons: The things I like least involve minor User Interface elements that I keep accidentally running into. The only example that really sticks out is I accidentally keep undocking some controls, and almost never remember how to redock them. It happens very infrequently, so I'm often in the position of researching how to redock them before I get back to work. It's honestly the only thing I can think of that would be a con for this software, and even then, that's in the user-error category. Pros: I have always been an enthusiast in the imageological projection of the activities that we develop in the Foundation, this with the purpose of visually enriching our task, and also to project it, either in social networks or in projections to the community that follows us, or to the sponsor who invest in our ideas and projects. That's why I introduced and presented to my bosses this software that has allowed us to edit images with a high quality, introducing modifiable layers, elimination of shadow or light depending on the visual result we look for, change the format of the photo either in jpg, png and even raw, doing quality works to expose them in a better way. GIMP is a high value tool for our Foundation and we carry out permanent training so that our operators also use it when publishing photographs of different community activities. Cons: Although, at the beginning it is a little complex to use since it is a program for editing images by vectors, only using them routinely makes you learn quickly how to handle all your tools. A rock solid choice for image editing. Pros: A free and feature rich alternative to Photoshop. GIMP also has a large following with many great tutorials available for new users to learn with. Scripting a plugin support is a big plus and defiantly worth your time to learn. Cons: The UI is not as refined as Photoshop and may take a short time to get used to. This may cause GIMP to be less user friendly to new users. On Windows, I have found GIMP to be slow on startup as it loads fonts and other resources. 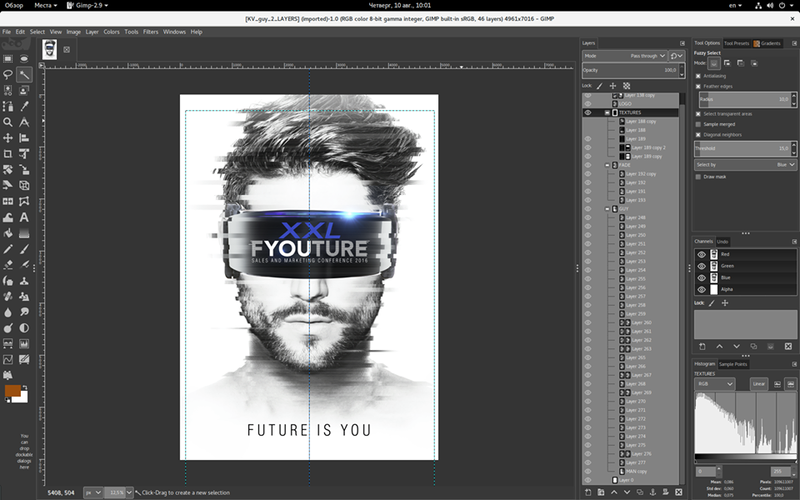 Overall: A open source alternative to Photoshop? I didn't believe it could be done until I gave GIMP and try and I haven't looked back yet. I use GIMP mainly for web design and found that literally every tool I relied on was present. 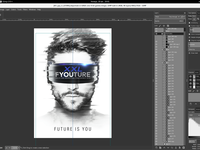 From image touching up images to designing banners and logos, GIMP has become my go to tool. It's scripting and plugin support also allows me to increase my productivity by automating common tasks and running them as batches. If a script doesn't exist, its surprisingly easy to write your own due to the large ecosystem of guides and tutorials. Pros: The greatest thing about this software is that it was free. I had been using PhotoShop for years and then a colleague recommended Gimp. I studied it before downloading it and it took me a short while to figure out how to use it. There are lots of videos on YouTube to help you get started and there are lots of video tutorials for the various functions. Easy peasy to learn to use, never crashes, never a problem. Cons: Nothing. I have been happy with Gimp from the day I downloaded it and have used it almost daily. It is a good software program. Overall: Very good experience with Gimp. It is easy to use, consistent, and works well for my use. I'm not a graphic designer, but I am a web developer and online marketer, so I need to be able to have a program I can use to pull up images and resize them, remove background, and so on. Every once in a while I make up a logo for a business I'm working with if I don't outsource it and Gimp works great for me. Pros: The advanced graphical functions are phenomenal. As I've developed (slowly), I've found that there is nothing that this application cannot do in producing incredible graphics. Specifically, if you think it doesn't have a function / effect that you want then there's almost endless plugins to choose from! If somehow even they don't provide, you can write your own plugins! I like that there are versions of this for Android too, meaning that I can work on my graphics across my platforms. Cons: With great functionality comes great complexity. I personally find Gimp to be extremely complex, especially on initial presentation if you're new to it. 3 separate boxes initially, which can rapidly grow, jumble the screen up. The vast array of buttons make clicking the wrong thing too easy, especially if you are trying to work at pace. While working across platforms is possible, as I mention above, the different versions are not especially well developed, especially the Android version. Overall: Overall, I come back to Gimp time and again. It is my desktop graphics package of choice. However, unlike with more user-friendly, albeit less functional, applications I have had to spend a lot of time learning from online tutorials before actually getting things done. It's not very intuitive. Pros: When I started learning about graphic design I had no money to buy the big fancy expensive programs. GIMP made learning graphic design very affordable and easy. The interface works very well. It is very easy to find the tools I need to complete an art project. There many different filters, and scripts to use to enhance my art as well. Cons: There are some features that are included in big name brand art software. Some of these features such as brush strokes, and simple shading and lighting effects. You have to take a lot of extra steps to recreate these features. Overall: I use this program on a daily basis. I use it for my own personal graphics, logos, banners, and designs. I also use it for my own video edits, and animations as well. I also use it for a lot of work I do for clients. I use GIMP for all my photo editing and creating needs from a simple photo red-eye edit all the way up to creating entire graphic set for a webpage. Pros: Gimp is free. That makes the value for money unbeatable. Also, it works fluently wherever. It does not need a powerful computer to work properly as is needed by his main rival: Photoshop. There is a lot of people who say that is not professional, but I have never ever had a client who asked me: do you use Gimp or Photoshop?. Also, apart from being free, Gimp has a big community of volunteers working on it, so, probably, it will get, if not every, the most popular functions in Photoshop. Gimp is easy to use and is a very very powerful tool that can make your life and photo editing easier. The only program that can compete with Gimp is Photoshop and is very very expensive. Cons: Ok. Photoshop is the only program that can compete with Gimp and it is expensive. But is more powerful. Has more tools, more automated things, and, more important: better management of colour. Also, even if Gimp is powerful, if you go to a job interview for something related to photo editing o graphic design, they will ask you about your knowledge of Photoshop. A client would not be interested, but a boss will want you to know Photoshop, even if it is "using a sledgehammer to crack a nut"
Overall: They have a huge and omnipresent competitor, but, when I can't pay for it or when I need a fast photo editing or I do not have a powerful computer near, I will never doubt that Gimp is the way to go. Pros: I don't even know where to start. There are basically limitless functions with more being written almost daily. Plug ins are plentiful if you scour the web and you can find so many great tutorials to teach what you don't already know. I've never really had the money to be able to afford the adobe suite for my personal life, so I rely on freeware programs such as GIMP to do much of my personal work. There is a huge community out there that can assist you with finding exactly what you need to tackle whatever project you have at hand. Cons: Honestly, there isn't much I don't like about GIMP. If i had to say one thing, is that it is resource intense. Your computer may run slower when using GIMP if you have an older or less powerful PC. This is the only issue I really have with GIMP, but you could say the same about virtually any program like it on the market today. Overall: Since I began using GIMP, I've had a lot of fun creating various edited photos and have used it for graphic design as well. I think it is a great program for anyone from beginner to advanced level. I'd highly recommend using GIMP as a starting point if you are considering going into any creative field where you think you might need image editing experience. Pros: This software is completely free, first of all. It runs and updates through software engineers donating their time and minds to the project. I read a lot of reviews before loading it onto my tablet because I didn't want to waste what little space I had on the hard drive. I came across some reviews that said Gimp was not user-intuitive, that there is a lot of manual work for the user. Personally, I find the program to be so similar to Photoshop that a non-techie like me has pretty much all the knowledge to use the program from the beginning. Same dark tinted workspace, same tools and their placement. I kind of was able to dive right into the program without having to stumble around too much. My favorite feature, ability to cut pieces of images out and paste elsewhere, and transparent layers. Great program. Thumbs up. Cons: I suppose something that seemed odd in reviews is that it doesn't have an extensive user manual. It's not a totally known program so there are many forums on tech support for the software. Most of the help, I read, would be from non-English speakers so I will have to start translating soon when I need help with an issue. One thing that I did notice - and this is being picky - is that there is no smoother tool, or at least I have not readily discovered it yet. It's a minor thing but that tool has saved me in AI when my hands weren't all too steady. BUT I found that you can just press shift and bring the paint tool across to whereever to make straight lines. It doesn't help much with curves but still something. Overall: Again, not many complaints for Gimp. I was so happy to find this free software and it is really amazing that there is a tech community willing to keep this free and updated as much as possible. Even if they had to charge a little fee in the future, I may just pay the fee because this program has been so useful to me. GIMP provides an efficient and impressive workspace for graphics with no catch to the free price. Pros: GIMP is an excellent, free graphics editor to rival Photoshop in everything from basic image editing to digital art. It combines an astounding amount of features into one bundle for no cost. Many other free image editors include only a few tools, but GIMP truly has them all. You can make vector images with the pen tool, import custom brushes, and edit photos as needed. I've used this program for professional and hobby use, and it fulfills both. It's great for making quick graphics without the constrictions of word processing software. It's also a reliable and complex software to complete long projects with. I was impressed with the range of technical tools, such as minute photo adjustments (with the lasso or magic wand). GIMP is a little slow when processing very large images, however, it runs well on almost everything I've used with it. Its menus could also use some optimization. They're not intuitive, and they group functions in a way that makes them hard to find. It is less polished than its paid rivals, but the functionality is nearly identical. Overall: I was able to edit graphics professionally without the need to purchase software. Pros: i love this program. And it's free. FREEEEE! No student versions or trial periods. I've been using Gimp to create digital art for years and it as good as any program I've used. Used with a Wacom tablet, I can do rough sketches, fine line work, and final coloring. Full features brushes, color selection, pressure sensitivity, etc. Layers are very versatile, and I can create masks, copy and merge masks and layers. Selection tool is powerful and can grow and manipulate the selection. Colors can be corrected. On and on and on. Cons: My Wacom tablet flakes out a lot, where I lose pressure sensitivity when first opening the program and have to close and restart. I wish GIMP was a better at selection and gap closing, so I can do color fills without needing my line work to be perfect. Tools to help improve lineart would be nice. Clean up noise, smooth, etc. Would like different tools to creating strait, same-thickness lines. Vectors and path strokes take a lot of effort. Overall: I don't deserve this wonderful, free, versatile program. It's nice to paint without being a pirate or throwing a ton at something pretty much equivalent. I've made some cool stuff this with Gimp. The best image editor on the planet, bar none! Pros: I rated support at 5 stars due to the absolutely massive online open source community both assisting with and writing extensions for GIMP. There is no paid version (that I know of) nor is there formal support, but said community takes care of all that. GIMP is a drop in replacement for Photoshop, only turbo-charged with infinitely more options. Cons: The only drawback to the GIMP, like any image editor, is the steep learning curve - this is more a function of what it's used for, though, and not of the software. There are tooltips for every function and a painstakingly thorough man page to help, not to mention online forums. Overall: GIMP is my go to for any image editing, be it cropping a picture for size or looks, building a new logo, replacing lettering with a static image, or snapping a mockup. It is indispensable as a design tool. Pros: I used GIMP for years now as a substitute for other paid editing softwares and i gotta admit, it provided all my needs and more. Few years before, I used to work as environment designer in a horror game, I created and edited most textured with gimp and I was astonished with the results I got got. The interface is familiar to anyone who is used to editing . It provided all the necessary tools u will ever need. It has a great customer support and community. Small size for what it does, easy to download and setup. No pop ups or "enter credit card to use" totally free. Now, I own a marketing agency, and I use gimp for all my photo editing and designing. Its my go to to get the job done in a professional way. Cons: -Back when I used to be an environment designer, I struggled in integrating Gimp with some texturing and sculpting softwares. - The insert text tool and everything about it needs an update. It feels outdated, not practical enough and doesn't match todays standards, needs more fonts and options to play with it. I personally use other softwares to create all my texts then import them into gimp. I rather not jump between softwares to be honest. Overall: I really love gimp, I used it for years now , to accomplish many things for many purposes and it still my go to photo editing software. GIMP is great! You can edit any image easily and it's free! Pros: GIMP is a fairly complete image editing software, layer management is very good, has a large number of filters; You can also export the images in different formats such as TIFF, JPG and PSD; this allows compatibility with other image editing software. The user interface to handle the levels and the color curves are excellent. In addition, it is a software that does not require a high performance PC. Cons: There are few plugins to add new features, the view grids are very dark sometimes the image does not look good. There is little documentation about GIMP, as well as very few communities. Overall: GIMP provides all the necessary tools to edit your images as a professional. It is an excellent image editor. If you need to improve the photographs for your marketing campaign this is a good option. Pros: What I like most is that it allows me to do what PhotoShop does without having to spend hundreds of dollars (to do the same thing). It's fairly straightforward and the "Help" section usually affords me the ease of use I need. I'm not a master at this stuff so it's good to have tutorials and extra help when I need it as I navigate my way through the program. Cons: Sometimes it does get a bit tricky for me. Mostly because I'm not a master of such programs. I suppose, in time, this will change. For now, though, I appreciate having it. Overall: As an artist, it's important to me that I can take photos to use for internet exposure. This isn't always as "easy" as it may sound. GIMP does a great job helping me along. A great program with plenty of features to do the job I need it to do. Pros: Gimp is a free photo/image editing tool. That is, by far, the best benefit of the software. For new artists, or users who only need more powerful image editing features, Gimp is perfect in value and capability. Not only that, but the open-source community is a great resource for problem solving and learning. I cannot say Gimp is better than the alternatives on the market, but like I said the price of entry is zero. I have introduced a number of professionals to this software over the years, and it has really opened up tons of possibilities that were previously out of their reach. In short, if you want to get into photo/image editing, processing, or manipulation, then give Gimp a try. Push yourself to learn all that it can do, and if you want more, then upgrade to something bigger and better. Cons: Gimp has historically had a steep learning curve and been error-prone. Much of the compatibility issues and buggy code has been sorted in the past few years, but for legacy hardware it can still be challenging to achieve stable performance. But there isn't much to complain about with Gimp. Many creative and intelligent people have poured oodles of time into making this software shine, and it is available to anyone. Overall: Gimp is a great first step for users who are new to the image/photo editing world. I highly endorse Gimp for students, scientists, and engineers who are learning or only need to use the software occasionally. The best choice in free image editing software! Pros: It has good performance in basic computers, it has all the necessary tools for photo editing, the work with the layers is quite good, the filters work quite well, you can open an image directly from the internet, you just need the URL and you are ready, the files Images are compatible with other image editing software if you export them. Cons: It is a bit slow, especially if the images are very large, there are not many tutorials on the internet, the design is a little outdated, I think it is very gray. You can not open the RAW format of professional cameras. 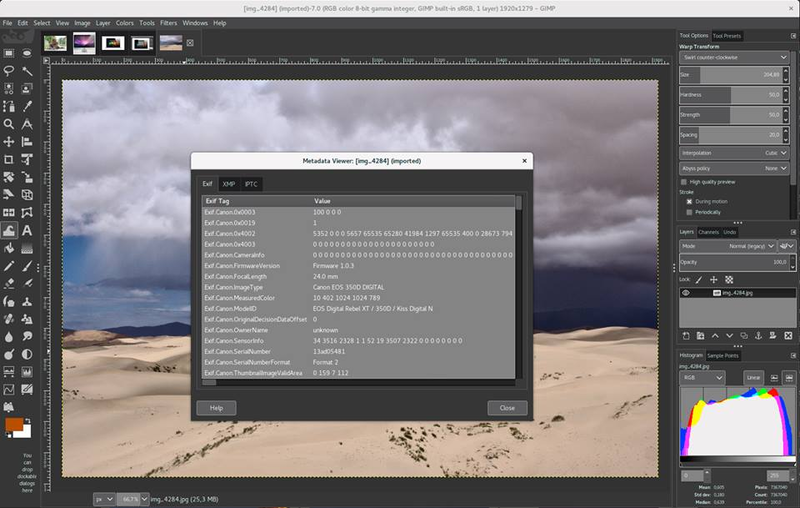 Overall: As a journalist and Community Manager you need high quality images, many times they have to be edited after the shot, GIMP is an excellent option to do that job; In addition, it is free software! Professional and effective image manipulation tool, a valid rival to PhotoShop. Pros: GIMP is a professional software for image manipulation. It is free and open source, meaning that it would surely evolve over time. You can use it by installing the software on your computer or using it portable, no-install version, GIMP portable. Through GIMP I daily create logos, banners and other graphics. Photo editing and retouching are some other way to use it. It does not require a powerful computer, it works well almost on every laptop and it is available both for Windows and Linux. It is a solid alternative to Photoshop and it also allows reading and writing PSD files and importing PS color palettes. GIMP has some cool features like layer styles, content-aware resizing, GIFs creation, face swap and many more. Cons: Compared to Photoshop, GIMP interface may appear more raw and less polished and it seems less user-friendly than its counterpart. It is not so much easy to use because of its steep learning curve. Overall: I find GIMP a solid alternative to PS. It could do almost everything Photoshop can do but it has an added value: it's free. Pros: Gimp is a great image manipulation software being a free alternative to paid software like Adobe Photoshop, as is the biggest option out there for Linux. The software is rich in features to work with, and despite some of these are a bit tricky to work with, Gimp compensates that by being more stable and consuming fewer resources than other software. Also, the amount of formats that the software is compatible with is amazing, including those from paid software. Another positive aspect is that GIMP is fully portable as well, making it possible to not just bring your project but also keep working on it in another machine. Cons: The interface is a bit hard to get used based on other software, and sometimes one of the tools get glitched after closing GIMP, where you need to end the service to close it. It also requires to looks constantly for instructions online, as documentation is still somewhat limited and not as intuitive as other software. Overall: I have been using GIMP to work in graphics that were later used on a website or announcements in my workplace, and while I don't find it as comfortable as PhotoShop nor is my main choice personally, the experience has been good and even saved me from some later troubles. Gimp is by far the best bang for you buck! Pros: Gimp is free, Gimp is a super powerful photo editing tool, Gimp has lot of functionality and tools in addition to a huge fan base with knowledge articles and how to forums. I can't speak highly enough of this product, it has the capability to accomplish everything that other photo editing softwares have. And it's FREE! It's an easy install on your desktop, has the ability to save projects, export to various files etc etc. I utilize it all the time to edit our watermarks, create prettier photos, and apply filters to photographs. I highly highly recommend using Gimp before purchasing another software. Cons: My only gripe and I think this is very common on most photo editing softwares is that is takes a looong time to learn the tool and figure out how and where all those tools are. It's not very user friendly, but then again I've ever used a similar product that was. Because I don't use the product very often I do forget where and how things are located in the application. I find it cumbersome at times to use. But hey it's free! Pros: GIMP is generally the first thing that comes to mind whenever you think about open source image editing software. Aside from some of the automated features in commercial software, GIMP offers a complete set of image editing tools. Generally I use GIMP to make small modifications during web development. Despite originally being designed for Linux, the Windows client is just as responsive and efficient. Cons: As to be expected the learning curve for advanced use is very high. Unlike using a Microsoft Office product, any seeking to develop proficient image editing skill will fare better with guided or classroom instruction over a self-guided approach. Pros: GIMP has almost all the functionality Photoshop has for simple and more advanced photo editing. Since 2.10, it finally has official WebP support and has a more modern UI. Once you know where to find all the tools you need it is easy and fast to use. It is open source and cross platform so it can also be used on operating systems like Linux. Cons: Some of the icons are not very clear so you will have to hover over the tool first to know what it does. By default GIMP is in multi window mode, which is really annoying to use in my opinion. Luckily you can switch it to single window mode. Some features are still a lot better in Photoshop or only available in Photoshop like content aware fill and filters. It takes quite a while to start GIMP. Overall: It is a good alternative for Photoshop if you only do basic photo editing and even works great for some more advanced editing, especially since it is totally free to use, compared to Photoshop's subscription based license. But for some features there is unfortunately still no good alternative for Photoshop like content aware fill. Pros: FREE! this is an open source free version of Photo Shop. There are tons of plugins for GIMP and it has so many features it is easy to get lost in it all. The program is capable of doing just about anything that you can do in Adobe Photo Shop. It is an image editing and manipulation tool. That is not to say you can't create original works of art in it though cause you can. It runs on Linux, Windows and Mac so you are covered no matter what machine you have. Cons: The interface could use some polish. The panels can become a little confusing and overwhelming at times. and they some times get lost with them all being separate windows on the desktop if you keep a large number of windows open at all times. Overall: GIMP has been my go to image editor for many years I have used it since version 0. something which has been a while. It has grown and has a large community of users and developers around it so whatever you may want to do in it yo can probably google up someone that can tell you how to do it or a plugin that does it for you. Go forth and draw! Pros: Originally designed for Linux, the Windows version is an extremely stable version with a good collection of basic and advanced photo editing tools. The interface is simple and clean with a fair bit of customization allowed, both of the UI and general features using Python powered extensions. Coming from a competitor's software, GIMP supplies a great deal more than basic control over your work that comes extremely close in some areas and surpasses in others. What isn't there can be added through user/developer created plugins from a very active and strong community. Since the software is open source, the potential to acquire or create tools specifically for your use is quite high. Cons: There is an extremely steep learning curve and little to no built-in guidance on using the program. Even the manual has to be installed separately and it covers little more than an overview. Being a community developed program, new features are added slowly. What's more is that there is no guarantee that this software will continue to exist in the future should it fall out of favor, though this can apply to almost any software. The best nuts and bolts graphic design tool for graphic designers on a budget. Pros: Gimp has long been the best free graphic design paint tool for graphic designers who couldn't afford or chose not to work with Adobe Photoshop. In the beginning, Gimp was a stable and functional paint software that allowed anyone access to graphic design tools and was utilized by beginning graphic designers and students or those who wanted to learn by doing in the comfort of their own homes. While Gimp is still an open sourced software source, it's gained a maturity and sophistication that marks a truly well-loved software application. What truly marks it's evolution is the community based development of the open source concept. With so many working on bugs, improvements and innovations, this Paint/Image program has evolved with surprising stability and functionality. Those in the industry may prefer Adobe products but this program can easily give Photoshop a run for its money. Cons: As a designer, the framework and aesthetics of the workspace do have an impact and GIMP isn't the most attractive software out there. Having said that, its capability and power to handle most of the tasks that the larger software giants can makes it a viable option for freelance designers who want to keep costs of doing business down. Overall: The best and most powerful open source image manipulation and paint software for graphic designers. GIMP is a free photo editor alternative to Photoshop. Pros: Probably that it's free. Programs like photoshop can take a large chunk out of your wallet for the boxed version, or a small but continuous draw for renting it. GIMP on the other hand, is free and open source. This means that programmers can modify the code of GIMP and redistribute it with their changes. Although it may lack the features and overall quality of Photoshop, GIMP makes up for it in price, and power. Cons: While GIMP may be more powerful in editing photos, Photoshop is quite a big competitor. A lot more people know about adobe photoshop than they know about GIMP, and this makes Photoshop the industry standard. 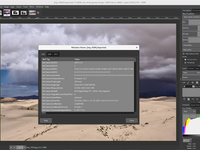 Adobe Photoshop has several tools and other automated touch up tools, while GIMP takes a more manual approach, and has the user use the editors power to touch up photos, instead of being automatic. While it does take longer, and the process is not as streamlined, photos come out more natural and better looking than any automated program. Overall: I like it, as it was a free alternative to photoshop when designing Six Flags ads. The red eye reduction process was my personal favorite, as it COMPLETELY removes the red from the iris, this was a real problem, because most of the photos were shot inside, with the flash on.